Maintenance of the Pixel Tracker has been ongoing since it was extracted from inside CMS and safely stored at low temperatures in Pixel laboratory at Point 5 (see previous Bulletin). All four half cylinders of the forward Pixel detector (FPIX) have been repaired and the failures have been understood. In October, a team of technicians from Fermilab replaced a total of three panels that were not repairable in place. The replacement of panels is a delicate operation that involves removing the half disks that hold the panels from the half cylinders, removing the damaged panels from the half disks, installing the new panels on the half disks, and finally putting the half disks back into the half cylinders and hooking up the cooling connections. The work was completed successfully. The same team also prepared the installation of the Phase 1 Pixel pilot blade system, installing a third half disk mechanics in the half cylinders; these half disks will host new Phase 1 Pixel modules that will be installed early next year. Along with the newly designed front-end and supply tube electronics these new modules will form the Pixel pilot blade to test Phase 1 Pixel readout during 2015 and 2016 running. The failure of the barrel Pixel detector (BPIX) modules, which correspond to ~2.3% of all BPIX channels, are due to broken wire bonds or faulty services, such as broken analogue-to-optical transducers and disconnected sense wires. It was decided to start the repair and replacement work with the modules and services that are located on the outermost layer due to easy access. Eight new modules were brought to the Pixel laboratory and replacement work is ongoing (seven of the eight successfully replaced as of end November). With these replacements the portion of BPIX with failures will decrease to ~1.1% of all BPIX channels. After the module replacement on the outermost layer a risk assessment will be performed to decide whether or not to replace the modules on the inner layers. In parallel, a calibration effort has started on the whole detector. One half of the BPIX and one fourth of the FPIX have been calibrated at 0 ºC. It is planned to calibrate again at the lowest temperature achievable in the Pixel laboratory. We have almost completed the preventive maintenance replacing the VME power supplies located in USC and in the test stands. The VME PCs in USC are also being replaced with more modern PCs with new VME controller cards. Image 2: One of the pilot half disks with cooling tubes attached but not connected to the manifolds. Paper-made modules demonstrate the final position of the real Phase I Pixel modules. After an intense Ssmmer, which ended with the commissioning of the dry-gas membrane system, a huge refurbish programme of the C6F14 cooling plants and a preliminary humidity sealing of the bulkheads and the service channels, time has come to check the status of the detector. Much care has been taken to re-balance all cooling loops and crosscheck procedures guaranteeing a smooth and safe restart avoiding overpressure on the detector. This was successful and we had no leak rate increase at 4 ºC nor at –10 ºC. The Strip Tracker’s recommissioning at 4 ºC started carefully by checking control-ring integrity and continued with calibration runs to assess detector status and situation of historical failures and components masked during Run 1. We joined the Global Run in November (GRiN) on the first day. The ‘Tracker Going Cold’ campaign attained an important checkpoint: initial temperature was progressively being lowered in steps to 0 ºC, –5 ºC and –10 ºC while Tracker HV was on and DAQ was running. The Pixel loops – in by-pass – were even operated at –25 ºC. Numerous new environment sensors allowed a good understanding of the dynamics of humidity and temperatures during the process. During transitions, Laser Alignment System (LAS) data was taken, suggesting no movements more than a few microns, being cross-checked by the alignment software MillePede II. Warming up showed stable humidity in the Strip detector and its service channels but showed some RH increase during transients in the 6- and 12-o’clock channel positions where the densely packed, non-insulated Pixel pipes are located. This effect is under investigation. 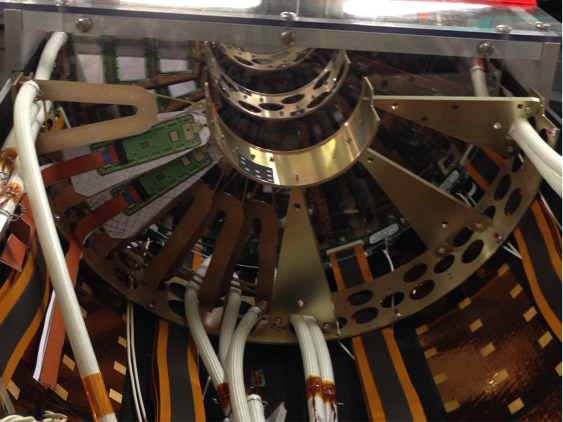 We’ve seen a detector running flawlessly with cosmic data acquired at each temperature step. Data quality, monitored online by the Tracker DQM group and analysed further offline, was sound at 4 ºC and encouraging at lower temperatures. Later on, CMS performed the foreseen latency shift by +12 bunch-crossings in preparation for L1 Trigger Upgrade and Tracker participated without problems; dead-time increase was 0.1% within expectation. Annual maintenance of the cooling plants including new insulation of plants started right after GRiN. In parallel, the Strip DAQ was being moved to new VMEPCs including new interface cards. DCS started preparations for migration to WinCC 3.11, superseding the older PVSS. On the offline front, performance for Run 2 and beyond is being addressed by adding gain and bad-component calibrations to the Prompt Calibration Loop at Tier-0 and mastering detector features, such as Lorentz Angle (LA) or noise correlation. In parallel with Tracker Upgrade simulations, our DQM team improved the validation suite, encompassing new geometries for Phase 1 and Phase 2. Preparing for the future goes together with providing the best of Run 1 detector performance and a big effort of the Alignment group is to correct and control systematic biases and time. Updated conditions were delivered for 2011 Legacy reprocessing of data and MC production using alignment of local-y coordinate in end-caps and updated LA and backplane corrections. New conditions enhance the Z mass resolution by an impressive 10% and largely improve the φ-dependent curvature bias. Tracker had a very active year and welcomes 2014 with new challenges and intense preparation for Run 2: the best time to come on board!